Write a review of Roy Mottahedeh’s The Mantle of the Prophet (2008- Oneworld Publications). Your review should include (a) an assessment of the Madrasa system and (b) a discussion of the intellectual journey of ‘Ali (the main character in the book). The madrassas are open systems of ‘great enclosed spaces’ which emerged from the traditions of ‘old styles of learning’ associated with a culture of attainment of knowledge which saw people ‘wandering from teacher to teacher’. The education that the talabehs received was centered around the organization of the informal discussion circles or the halaqas. The curriculum of the madrassas includes the study of logic, ‘which provided a set of systematic principles for deriving the law from its sources’. Such knowledge is described by Mottahedeh or seen by Ali as ‘a tree that draws its food and water from questions’. The learning provided in the madrassas marked a quest that distinguished these students from ‘the rest of the uninitiated’. In this sense the juxtaposition of the madrassa within the middle of the inside and outside space is significant because the separation of space as inside (andruni), outside (biruni) were ‘rules that no one dared to violate’. Initially the madrasssa were also a battleground for ideology, which predominanly excluded the Shia for not following ‘true’ religion. Shia Sunni one major difference in contrasting intellectual appraches. In this sense both sects saw themselves as protecting the true religion and their institutional politics were informed by the political rivlary between themselves. In later times another tension became manifest between the secular and religious. The ‘secular Iranians of the new education’ rejected the madrassa system seeing it as a backward insitution in modern times. The political patronage of madrassas also became a part of the ‘ideological armour’ of the state when it realized that the teaching that had been implemented a millennium earlier could be used to its advantage. Mottahedeh compares the madressa to a fortress which is ‘seen and sees [itself] as the primary focus of attempts to preserve learning and defend orthodoxy’. It was pecisely because of this defensive and rigid orthodoxy that mysticism had many opponents in the madrassa and that the ‘mystical implications of theology’ were overlooked and unacknowledged. However from Ali’s personal viewpoint we come to know of the existence of another stream of consciouness in the hawzeh which believed that ‘a mature understanding of Islam came not only from books but from a mystical understanding of the world’. In Ali’s understanding ‘mysticism was a method which was clearing a road to knowing things that transform one’s existence’ but it was also an intensely private matter for him . In this sense the external binary notions of interiority and inferiority seem to carry over into his personal life as well. Ali puts a human face to the uncertainity that lay behind that machinations of the Iranian revolution. In a paradoxical way the longing for the the past and the apprehension for the future after the success of the revolution is ironic since he is a member of the clergy himself which is poised to claim unsurmountable power. As Mottahedeh describes it ‘he(Ali) knew for certain the past could not return, he felt surprisingly uneasy about what this banner might mean for the future and, more especially for him, for his responsibility as a learned mullah and descendant of the Prophet, a man entitled to wear the Prophet’s color green.’ However such a position is indicative of a sensibility amongst the ulema which is far removed from the image of the power hungry and politically manipulative clergy that has become predominant in the present discourse on the subject. It shows a sense of purpose and responsiblity that Ali felt for his position. His humility that led him to believe that ‘God forbade anyone to call him an ayatollah when there were others, his senior in learning and in every way, who deserved that title…” seemed to be derived from this sense of responsibility. This was also reflecte in the fact that he “lacked the courage—he was tempted to say audacity—to tell other people how to live their lives’. However it was not just that he felt obliged as a Sayid or from the fact that he was a cleric but he also seemed to like what he was doing or as Mottahedeh’s frames it ‘he had a real taste for mullah learning’ which made him to ‘anticipate future difficulties’ on theoretical positions and to easily re-explain the significance of past texts to others. In short his life in Qom was grounded in such traditions so much so that in his earlier part of life, as Mottahedeh indicates, he is oblivious to another kind of existence that was ‘rejected by secular intellectuals’. For him ‘Tombs were facts of life’, as was the life that revolved around them. From the beginning Ali’s proclivities for spiritual or religious teachings set him aside from his contemporaries, as well as the fact that he has an added advantage over others given his family background. His forays into solitude seeking exercises such as hiding under the bushes lead to deep ruminations into existential questions such as the reasons for ‘why wars happens’ and ‘no one seemed to win in the end’. This trend seemed to continue into his later life such as after his mystical initation and his experience of ‘seeing the light’ he did not want to share his experiences with anyone, even as he rejoiced them internally. Even his joy was private for him. But it was eventually his sense of responsibility that forced him to shed his detachment to the world and overlook his private side to fully undertake his responsibility. His political awakening, was another factor that led him to take on a more pro-active public role. The Algerian revolution became a catalyst to incite a sense of political revolt in Ali, and the ‘ fire burning in the Algerian desert kindled a fierce burning inside him’ . So much so that the ‘Algerian struggle became Ali’s struggle’. The personal became the political for him and it was in this way Ali’s life was informed by such responsibilities and outlooks which came from the acknowledgement which led to him to feel ‘more conscious that people saw him as fulfilling a destiny thrust on him both by his descendence and his learning”. This was an interesting article recently on the growing Shi’a-Sunni sectarianism in Iraq. If the details in this article are true than it seems really unfortunate to hear that the Shi’a are treating their Sunni countrymen with the same amount of discrimination and harassment that the Shi’a faced under the Sunni majority. It seems almost ironic to hear a description of the current Sunni viewpoint about the ‘territorial, institutionalized and psychological segregation’ being enforced on them because it is eerily reminiscint of the complaints that the Shi’a made during Saddam’s rule. 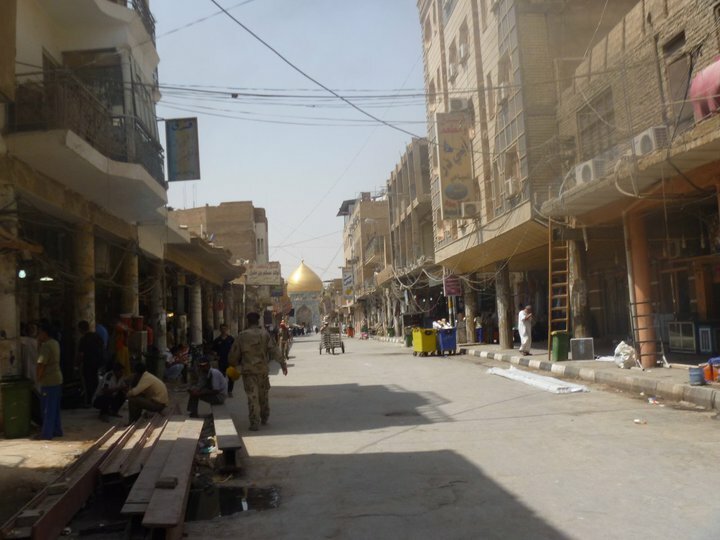 Given the extent of persecution that the Shi’a population faced it is understandable that the continue to hold grudges against the Sunnis but flaunting their demographic power on the streets and harassing ordinary people is something that deserves to be condemned. Another aspect of the article that I found interesting is the perspective they have presented from Ayatollah Sistani, which sounds really uncharacteristically aggressive and provocative coming from him. Sistani has been known to be a pacifist without any overt socio-political agenda and a big proponent of peace between the Shi’a and Sunnis, so it comes as a great surprise to come across quotes attributed to him such as him telling his visitors that, ‘You are the majority and your enemies are trying to reduce your numbers” etc. It also seems remarkable to hear that a reclusive person like Sistani, who hardly ever appears in public and refuses to be photographed, would commend or even allow his followers to display lifesized displays of him at every street corner. This was certainly not the case until last year. So in this regard the information in the article seems a little exaggerated or hyped. 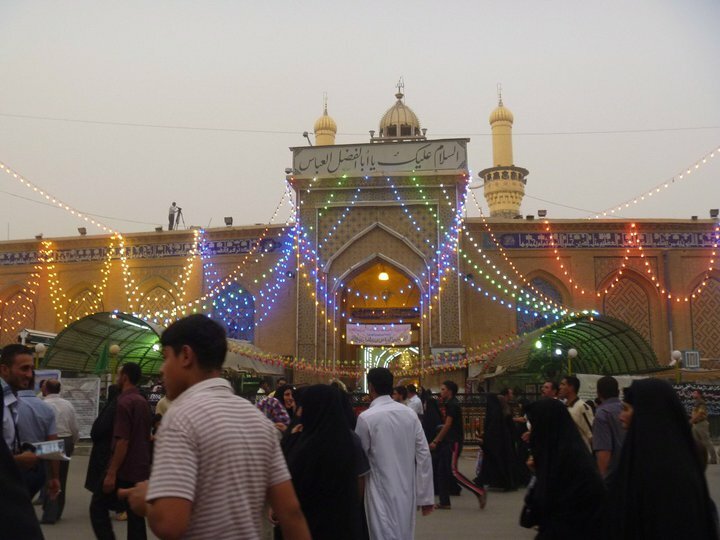 This is a picture of Sistani’s humble residence outside the Imam Ali mosque in Najaf, which I thought would be interesting to share regarding the kind of power that Sistani yields in the Shi’a world. The following links present different viewpoints on Sistani and other aspects of the sectarian conflict in Iraq. Compare and contrast the “classical” narrative of Imam Husayn at Karbala with Ali Shariati’s narrative. How do you account for the differences? Obviously a good answer makes reference to Franz Fanon’s Wretched of the Earth (2005). In the earlier narratives of Karbala the primary focus was the idea of redemption in mourning the suffering of Husayn. Husayn’s martyrdom at Karbala was seen as the fulfillment of the broader prophetic mission and connected to the persecution of previous prophets. In Vaiz Kashefi’s text circa 1502 the prominent figures of Karbala were not a symbolic set of political role models but religious ideals to be remembered and commemorated. The idea of Husayn rebelling against injustice and oppressive rulers was manifestly absent in these texts. This was seen as the responsibility of the last imam, the Mahdi, to avenge the death of Husayn. In these Safavid texts the mains villains in the Karbala narratives were the Sunnis, as they were also in the actual Safavid political context. However just because did not inform the earlier Safavid narratives did not have agentative connotations does not imply that they did not exist as a significant part of the story of Karbala elsewhere. The Abbasids and the Zaydis had both appropriated the Karbala symbols for their own campaigns. It can be said then that such opinions are best understood by the political contexts that they are used in. These early texts did not contest the legitimacy of the ruling elite and instead focused on idealizing ‘patience and perseverance instead of action ‘ perhaps because the authors themselves were part of the ruling elite who were wanted to maintain a status quo or were trying to appease their rulers. Conversely in 1960 Najafabadi’s revision of the Karbala narrative and his opponents like Gulpaygani gave it political agency by ridding it of the ‘symbolically static interpretations’ in order to oppose the Shah’s regime. In this sense the Karbala narrative was appropriated for political motives. Such politicization of the Karbala narrative took place manifestly during the Pahlavi regime, when Husayn was inscribed with a political agency. The oppositional political discourse presented by the Karbala Paradigm as ‘a historic rebellion against corrupt leadership’ worked well for the dissidents who recast themselves as the suffering martyrs of Karbala while the Shah became the personification of Yazid or Muawiyyah. The meta-narrative of Karbala which informed and influenced social and political discourse was revised from the dual opposition of pious and loyal Shia followers vs the disloyal followers and evil Sunni forces to become an opposition between just Muslims and unjust Empire. It is significant to note that this reinterpretation of the Karbala narrative in revolutionary terms met with resistance from the orthodox clergy who labeled it as ‘heresy’ and ‘refuted’ their arguments. It was in this context that Shariati’s unorthodox revolutionary interpretations of Shi’ism which used the symbolism of Karbala to condemn the Shah’s regime was rejected by the ulema. For Shariati(20005) the most important dimension in Islam was political and he sought to transform Islam into an ideology in order to galvanize the revolutionaries of his time. All the while he highlighted the centrality of Karbala, saying that ‘Every place should be turned into Karbala, every month into Moharram and everyday into Ashura’. Islam was seen as a struggle against the conservative tribal social order and he traces the origins of revolution back to the Prophets. In his narrative the revolution against conservatism that was initiated by Prophet Mohammad was in danger and Husayn’s sacrifice ultimately showed the world the right path. But Shariati lamented the loss of the revolutionary spirit saying that Islam has changed from a revolutionary movement that was opposed to aristocracy, class, tribe, race, despotism, and exploitation …. into ‘the opiate of the masses’, so much so that Islam was used to legitimize the wrongdoings of the elite. Shariati entertwined the Karbala rhetoric with revolutionary context and foregrounded the notions of shahadat and jihad in this narrative saying, “Husayn introduces shahadat as a principle above jihad and a duty when jihad is not a feasible alternative”. He attributed Husayn’s martyrdom not to any weakness but rather to dignity under oppression. In this sense his views resonate with those of Fanon who spoke of the oppression of the colonized people as ‘not a lack of heroism but a fundamentally different international situation’ which they faced with dignity. According to Fanon, ‘They fought as best with the weapons they possessed at the time’. Furthermore Shariati combined the symbolism of jihad, uprising and martyrdom with the notions of liberation of the masses of humanity, universal class struggles and anti-imperialist rhetoric to make the Karbala narrative more actionable. But immersing religion within such ideological contexts can be seen as problematic. No ideology is universal for all times and when an ideology fails it has the potential to taint the religion along with it. This can be understood to some extent in the light of Fanon’s arguments. Fanon seems to believe that rather than there being a universal goal for all to attain, all generations have their own distinct narratives which they must interpret according to the demands of their times, when he says that ‘Every generation must find its mission, fulfill it or betray it’. In this sense theKarbalanarrative was seen as a mission which was to be fulfilled or betrayed depending on the agency of the followers. However when the Shah was finally overthrown and the mission ‘fulfilled’ it did not lead to any permanent fulfillment but rather to further disillusionment for the followers of Shariati and such. Last week I was discussing the potential role of economics being unwittingly intertwined with the Shi’a pilgrimage ritual to the sacred cities in Iraq so this was an unusual but interesting story that I thought would be relevant to share this week. Many assumptions in this article are debatable such the fact that the Karbala pilgrimage culture has remained ‘untouched by wars’ or that Iraq is ‘quickly returning to normalcy’ after the withdrawal of US forces But it does present an interesting insight into the ways in which religious tourism is shaping up in the present day Iraq. The fact that these sites have become a hotbed of economic investment and development is not contested as can be assessed from these sources. But such information has a specific economic investment angle and it does not really talk about the impact such development is having on the local culture and also consequently in many ways the Shi’a pilgrimage ethos. Sadly this seems to be a very understudied subject in current research on the area which certainly requires more meaningful critique and analysis. Throughout the Saddam era the Shi’a population were ruthlessly socially and economically persecuted and repressed, a fact that reflected on the conditions of the Shia holy cities. 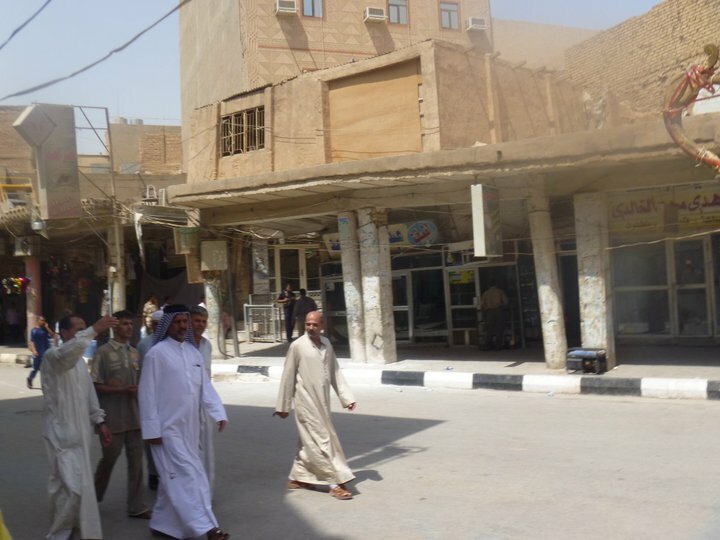 People who visited these cities in the 1990s recall how the Shi’a people in the Southern cities ofIraqwere living in horrendous socio-economic conditions with strict restrictions on their religious observances and pilgrimages. Consequently in the post-Saddam Iraq, with the lifting of such constraints the ethos of the Shi’a cities of Karbala and Najaf are changing phenomenally. Compared to other parts ofIraqthere is a visibly significant amount of development happening in these cities, which has also brought about some sort of a spirit of materialism which can be contrasted with the somewhat spiritual outlook of the pilgrims. In this sense there seem to be two different emotional registers informing the visitors and the locals it seems. The materialism of the street vendors who adamantly refused to be paid in any other currency than dollars or the enterprising hotel managers who try to haggle money out of you by offering lavish edible arrangements and facilities like rooms with jacuzzi’s etc can be disorienting for pilgrims but are all understandable from the context of the local socio-political conditions.